This is my way of saving holiday chocolate bound for the pantry abyss. I know this happens. Oh it hurts to think about it. Sometimes I see chocolates from Christmas pasts like ghosts creeping on to the dessert table on the following Christmas eve. Why? How can we live knowing that there is recycled chocolate filling festive candy dishes all around us. Chocolate deserves to be eaten in its prime just like anything else. It dies the second it meets the pantry. It dies along with last year's birthday sprinkles, pumpin pie spice mix and stale oatmeal. Don't let chocolate die this year. Throw it all into these cookies and I promise they will live a short but very very sweet reincarnation. 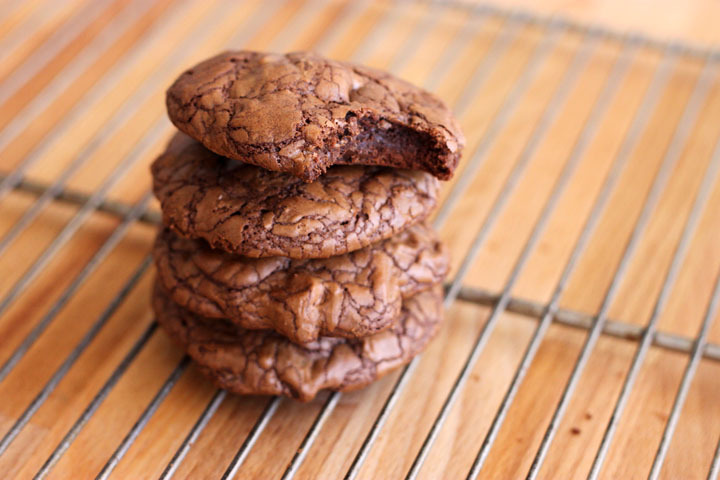 Exactly as it reads - you will need 3/4 of a pound of chocolate (that's 12 ounces) to make 20 totally decadent cookies. Semi- sweet or dark chocolate will work here based on what you like, what you have stashed up and how passionate your friends are. If you have plenty of the dark stuff then you have a lot of love abound. If all you have is milk, well then you might want to get new friends. There isn't much butter going into this cookie dough because hey, I think we've done enough damage with the all the chocolate. Just 4 tablespoons of soft butter gets creamy with white and brown sugar. We need two eggs and 8 ounces of that chocolate, melted. Flour, baking powder and salt go in. I like to add cinnamon and ground ginger but you can certainly leave it out. Just don't skip the salt. It works. Believe that. 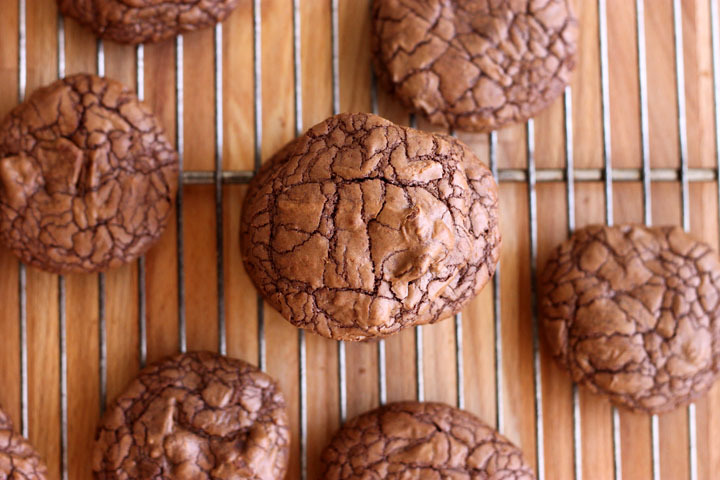 This is very much like a brownie batter than a cookie dough, but with a cookie dough method. It will be smooth and very soft, almost runny so it needs time in the fridge to thicken. It will firm up like fudge and thats when you can roll it into balls and bake. Feel free to leave the mixture in the fridge overnight if that suits you better. The result is chocolate turned into more chocolate. 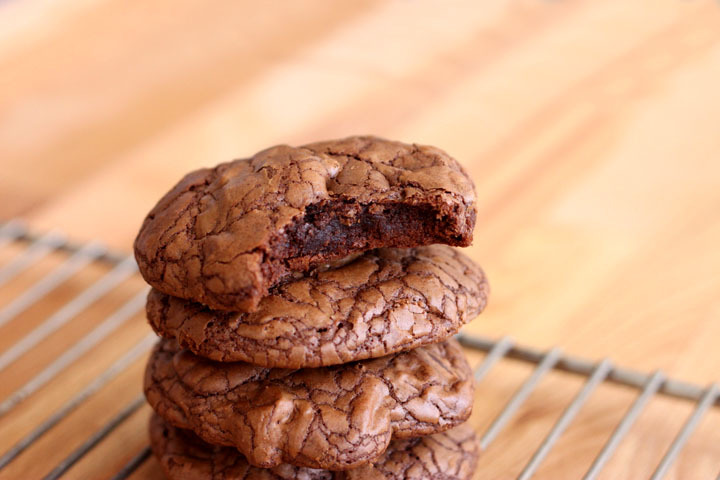 The reward is moist fudgey centers with a shiny crackly crust. Right now I'm hoping your new year's resolution involves reading or travel and not the shaming of delicious things. Delicious is the best part of life so don't let it slip away. Preheat oven to 375°F. Line 2 large baking trays with parchment paper. Melt 8 oz (227g) of the chocolate and set aside to cool. Coarsely chop remaining 4 oz (113g) chocolate. Sift flour, ground cinnamon, ginger, baking powder and salt in small bowl. Beat butter with both sugars and vanilla in a large bowl with electric mixer on medium speed until light and fluffy. Beat in eggs, one at a time, until well incorporated. Stir through melted chocolate until well blended. Add flour mixture to chocolate mixture and fold it in until combined. Stir in chopped chocolate. The mixture will be more like a thick batter than a dough. Refrigerate for just 10 minutes to thicken, but don’t forget about it or it will harden up. 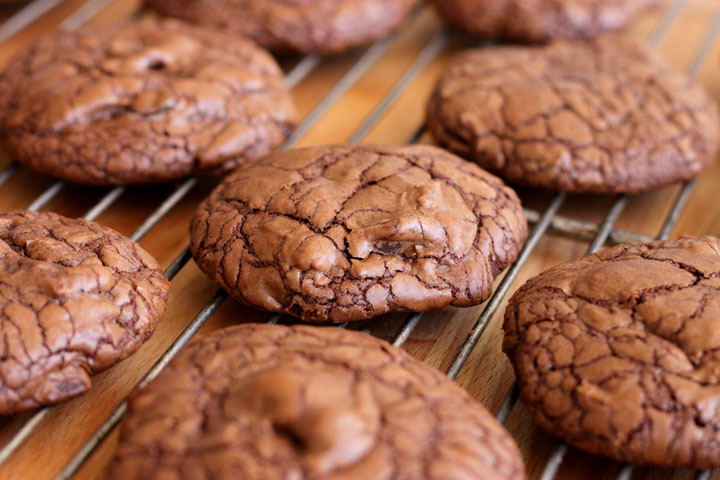 Drop dough by rounded tablespoons onto prepared baking trays, spreading them 2 inches apart. 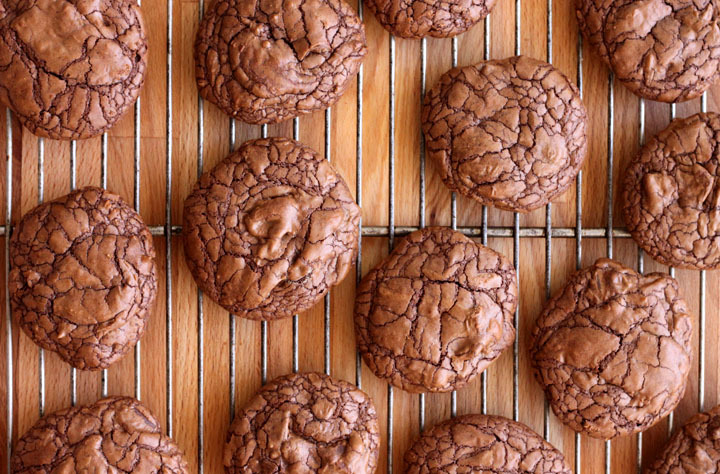 Bake for 8-10 minutes or just until cookies are set, shiny and cracked on top. Let cookies cool for 2 minutes on tray before transferring to a wire rack to finish cooling.